Anaïs Nin once observed that life shrinks or expands in proportion to one’s courage. I have pondered this for some time and am bound to disagree. Life shrinks or expands, at least to me, in proportion to one’s conversations. Last night I had an acute episode of Conversation Envy. I can tolerate the drivel most of the time, but deep down I secretly yearn for a philosophical argument and a fresh point of view with the odd bon mot thrown in the mix to keep things fresh. Living in a blaze of obscurity has its drawbacks. One is the quality of chat to which one is exposed. Quentin Crisp said that the key to speaking with style is to command of a vocabulary large enough to give you both flexibility and precision in expressing yourself. The more words you have the more accurate and entertaining will be your self-portrayal in conversation. These days one is engulfed in incoherence. Grammatical errors aside (“Between you and I”, problems with “infer” and “imply”, “flout” and “flaunt”), there is a paucity in topic matter. Last night I was waiting on a table of distinction. Both elegant women wore the kind of important necklaces that one can only buy at the Metropolitan Museum store: heavy amber beads and interesting silver. The men were straight out of Renoir’s Boating Party. At the end of the evening I had occasion to be near their table. Their conversation stopped me in my tracks. One of the men suggested that love, like evil, is a mystery. There was mention of ‘meaningless malevolence’ and references to the Classics. They may have quoted Yeats and TS Eliot. There was objection to using the word ‘apartheid’ in contexts other than the South African one. I did know what I was hearing, however. The quartet was engaged in mental callisthenics and the exchange of ideas. I yearned to partake of this conversational feast. I was having an attack of Conversation Envy! Usually I don’t bother to eavesdrop on conversations. They are invariably as useless as wet newspaper. Most of what passes as conversation flows as swiftly as papier-mâché. No one really listens to anyone else and if you try it you will see why. There is a difference between conversation and speech. People have not lost the power of speech. They have lost the art of conversation. Things are more interesting when a couple has a row. Then there are little popcorn bursts of truth. There is also a chance of collateral windfall. An arguing couple once stormed out of the restaurant forgetting a bottle of Dom Pérignon. I have one or two friends with whom I discuss what other people like to call Conspiracy Theories. But in the main I am a conversational anorexic. When I was a journalist, I had unfettered access to interesting people. 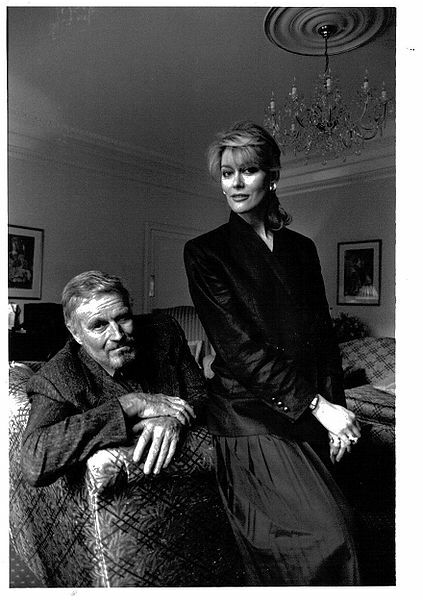 I interviewed Charlton Heston once at the Hyde Park Hotel in London. “Where’s your friend Elaine,” was his wry response. During the lunch gabfest he told me that his life’s philosophy was based on Winston Churchill’s exhortation to never give up. Political Correctness and the fear of treading on sensitive corns has all but bandaged conversazione. One certain way to prevent conversation from becoming boring is to say the wrong thing, but who has the brass ones to do so these days? As Schopenhauer wrote in “Our Relation to Others”: Politeness is a tacit agreement that peoples’ miserable defects, whether moral or intellectual, shall on either side be ignored and not be made the subject of reproach. I am tired of politeness and weary of anaemic conversation. Come sit here and talk to me….